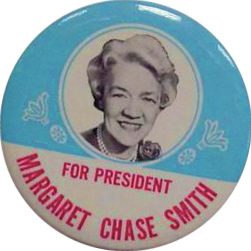 Maggie became the first woman to have her name placed in nomination for the presidency by either of the two major parties in 1964. 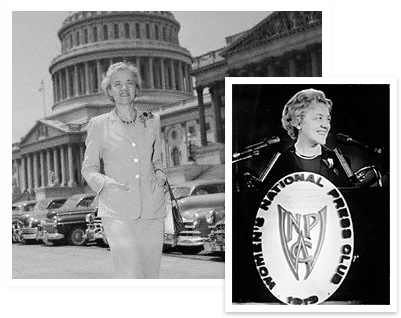 A trailblazer who served on the Appropriations and Armed Services panels and a crusader for free speech, Margaret Chase Smith was one of the first to oppose Senator Joseph McCarthy. Maggie represents one of the earliest and most enduring female voices in American political life. "Public service must be more than doing a job efficiently and honestly. It must be a complete dedication to the people and to the nation." "The right way is not always the popular and easy way. Standing for right when it is unpopular is a true test of moral character." "Every human being is entitled to courtesy and consideration. Constructive criticism is not only to be expected but sought." "When people keep telling you that you can't do a thing, you kind of like to try it." "One of the basic causes for all the trouble in the world today is that people talk too much and think too little. They act impulsively without thinking."